I really wasn’t sure what to expect when I first entered the boutique. It’s a little like walking backstage at a theatre, row upon row of white and ivory, silk and satin, swathes of veils and hair clips and trinkets sparkling from every corner of the room, doing nothing to dispel the idea that you really are just an eight year old fulfilling some sort of princess-style fantasy. I’m not the kind of person who particularly enjoys showing off in a changing room, strutting my stuff and voting by committee on whether my bum looks big in this or my skin looks sallow against that. Nonetheless, it’s hard to retain too much modesty when you’re in nothing but your underwear in front of the shop assistant as they pull acres of lace over your head and expertly begin to pin it all in place. Despite my reservations, I fell for the whole process hook line and sinker, enjoying every moment of the fairytale fantasy for the very first time. Wedding dresses are a little like baked goods (bear with me on this one). The much-mocked meringue dress is the soufflé of the wedding world – so hard to get right, perhaps not to everyone’s taste and with the potential for disaster if it doesn’t suit or rise to the occasion. The strapless dress is a chocolate chip cookie – the majority of people want one, have their own idea on what will make it perfect but is, perhaps, just that little bit too ubiquitous to make it truly special. Plain silk is simple and understated, a classic Victoria sponge perhaps but a recipe that can benefit from breaking the rules (a basic sponge can be improved with buttercream or added flavour in the way a plain dress could be made better by adding the simplest of details). And then there’s lace. Lace isn’t something I’d ever really considered until recently. My Mum wore lace for her wedding but it did take place over thirty years ago and I always wondered if there was something a little bit old fashioned about the whole thing. Delicate and beautiful yes, but perhaps not for me. If lace were some sort of food, I thought, it could be a custard cream, harking back to a time before we fell in love with cookies, cupcakes and brownies, served, perhaps, on a doily for added ancient effect. Turns out I was completely wrong. Lace is what I love. It’s elegant and flattering and beautifully intricate. It’s modest enough for a wedding without being boring. It’s exactly what I want to wear on my wedding day. Which brings me – in a slightly roundabout way – onto these tuiles. If ever in doubt about what kind of baking I like best, take a look at the index for this blog. It’s filled with several tier cakes, brownies and bars, cookies and tarts and a lot of the kind of in-your-face bakes that shout for attention with an instant hit of chocolate and butter and sugar. I’d never thought of myself as the biggest fan of delicate desserts, but when recently looking for something to accompany a simple lemon ice cream, I alighted on this recipe. 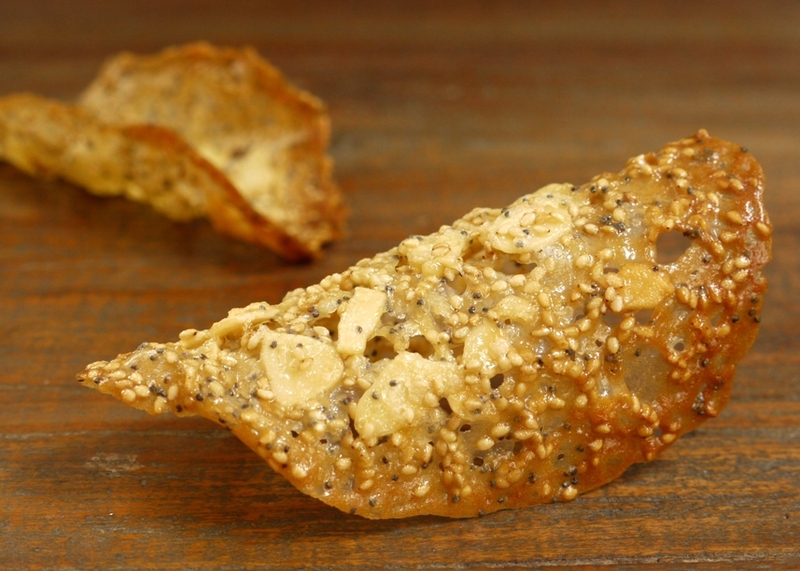 If lace were a baked good, it would be these tuiles. They’re light and dainty, delicate yet full of flavour, the taste when they snap then melt in your mouth so much more than their unassuming image would suggest. These, just like those lace wedding dresses, are the biscuit that surprised me, that make me want to continue experimenting in the kitchen as there is so much left to try, to be amazed at and to fall in love with. Warm the butter, sesame oil, orange juice, lemon zest and sugar over a low heat until melted and smooth. 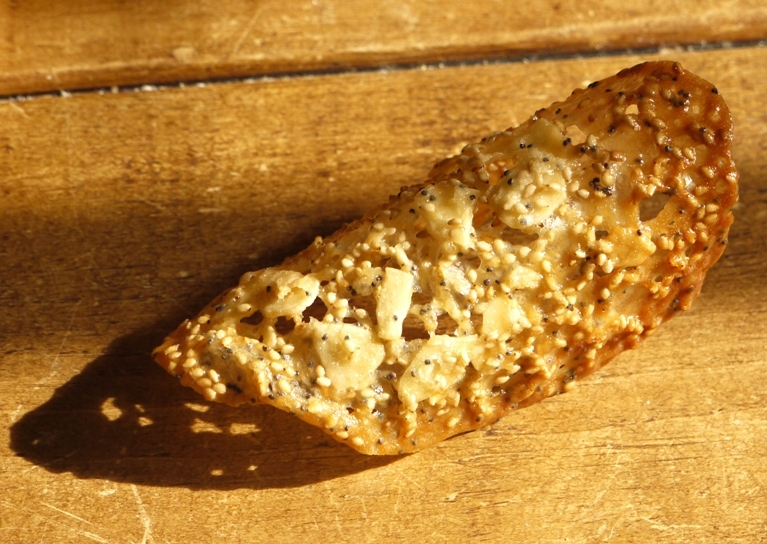 Remove from the heat and stir in the flour, almonds, sesame and poppy seeds. Set aside to rest at room temperature for one hour. Preheat the oven to 190 degrees C. Line two baking trays with parchment paper. Set a rolling pin on a folded dish cloth to steady it and set out a wire cooling rack. Drop level tablespoons of the batter onto your prepared baking trays, placing just four on each sheet and spacing well apart. Slightly flatten the batter with dampened fingers. Bake one sheet at a time until the tuiles are golden brown, about 8 minutes. Remove from the oven and leave to cool and firm up briefly, about one minute. Using a spatula, lift each tuile off the baking tray and drape it over your prepared rolling pin. If the other tuiles cool and harden while you’re doing this, simply pop them back in the oven for a few seconds to soften up again. Leave each tuile to cool on the rolling pin then transfer to your wire rack to cool. The more you make, the better they will look – like pancakes your first attempt is never going to be the most beautiful so save that one for cook’s perks. These biscuits are best eaten within a few hours of baking so that they retain their delicious, delicate snap. Haha love your comparison of dresses to cookies! I was the exact same way about lace…I didn’t think I would want it, but then my dresses ended up being completely lace and I thought it was the most beautiful thing in the world. Very pretty, I also love the lace comparison. so did you find the dress or do you have to do it again? and again and again? enjoy it and you are wise to buy one. I sew my own well it was a shantung silk two piece simple thing but I finished the same day. Plus a baked the cake. Don’t do that, take it easy and enjoy the day! Sounds like you are having a lot of fun trying to figure out if you are a “chocolate chip cookie” or a “tuile” kind of bride 🙂 I adore lace wedding gowns and these cookies look so light and delicate–love the comparison. These look lovely. I’ve always wanted to break into the tuile world but felt they were far too delicate for my crashing bashing fingers and I feared I would mess them up. Maybe I will try them now since yours look so fab. Love your wedding dress shopping comparison to food! Mine was definitely the tuile of the baking world. Glad you had fun shopping for your dress. I hope we’ll get to see photos. Lace is my favorite. I’m sure you’ll find a beautiful lace dress. 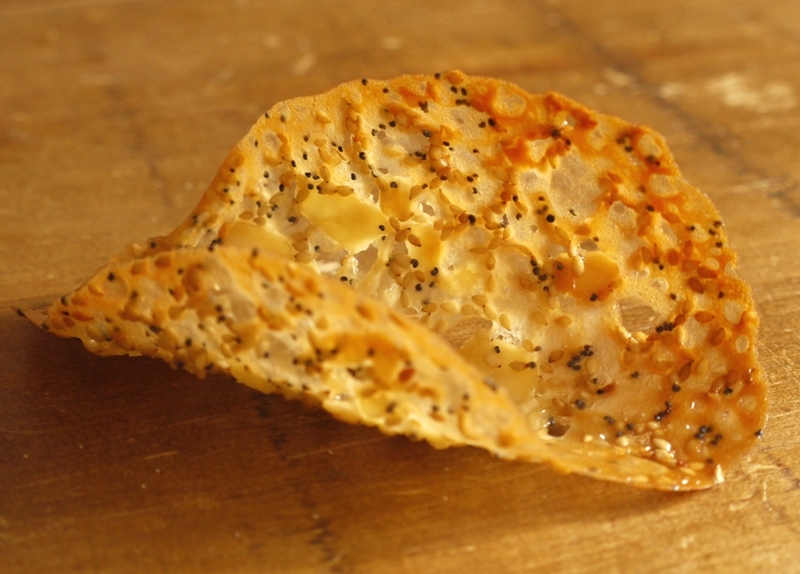 In the meantime, these tuiles are gorgeous. 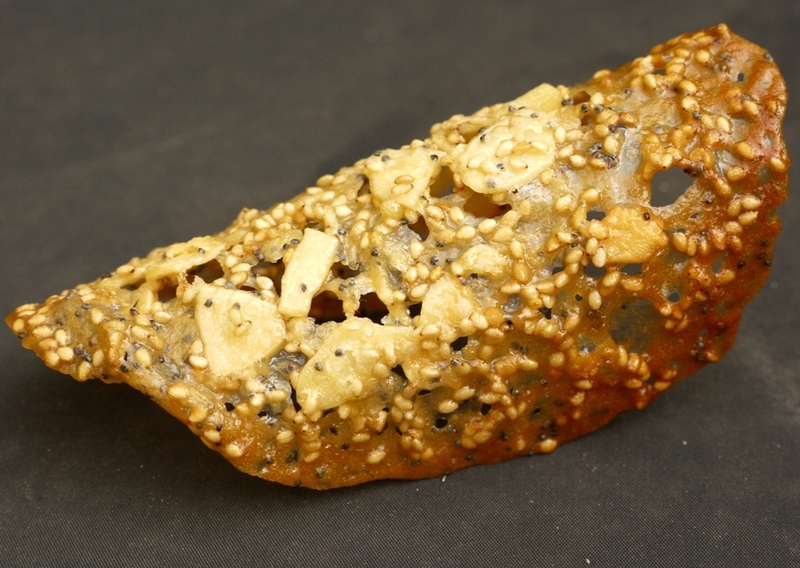 I made another tuile recipe of David’s from The Perfect Scoop not too long ago that had almonds in it. I made petite ice cream cups out of the tuiles, but I am especially fond of the elegant look of the traditional ones, bent lovingly over a rolling pin. The seeds and almonds make these gorgeous. The simplest things are often the most beautiful. I love the way you’ve managed to compare wedding dresses to baked goods, so funny 🙂 Pleased to hear you’re enjoying the experience of trying all the dresses on. The tuiles look and sound delicious too. Erin – I’ve completely fallen for lace, it’s just so classically beautiful. Connie – it’s so much fun, loving every second! Laura – do give them a go. My first few came out quite thick but as you practise they become more delicate and lacy. Jennifer – the wedding isn’t for a while but yes, promise to share some photos! Lisa – they’re not savoury! They are sweet and seeded, definitely no dip please! Sacha – all of his recipes seem to work so well. I love the idea of making them into little ice cream cups.